I had been struggling with whether to get into Tenkara for about three years now when I stumbled upon this website early in 2011. Thanks to Tenkara Bum I was able to finally discover some American sellers of lower-priced rods. I didn't know if tenkara would be something I would want to get into and didn't want to lay out a large initial expense for that reason. I agonised for a long time whether to buy a short 9' for small streams or a longer rod for the more open water of the small river that flows near my home (north Arkansas' Spring River) and my wide-open farm pond of 3 1/2 acres. I finally decided on the longer range and reach of the 14' Wakata right after it was fielded by Allfishingbuy. While not an attribute of the rod itself, Igor and Alla had my order shipped and at my door within three or four days of paying my money.....excellent service and I have nothing but good to say about their company and service. They also sell good tackle at a very attractive price. The rod itself is well-made and I like it a great deal. It is not a $500 rod but is made much better than I expected for the price. I am very pleased with it. My first session resulted in about 30 or 40 bluegills of various sizes and some smaller sub-10" bass from my pond. The longer 14' length of the rod immediately made itself felt with the longer range and I felt then and now I made the proper decision in buying it. I also believe the longer rod gives one much more leeway in fighting large fish, which I was soon to find out firsthand. I returned the following day and commenced to smoking bluegills one after another with #14 bead head buggers (which it handles with complete and total control; just lovely!). About 50 fish into the session I had another take that I immediately knew was something much more substantial than a 7" bream. After a fight of approximately 6-8 minutes I was able to land my prize (and I don't believe in nets! 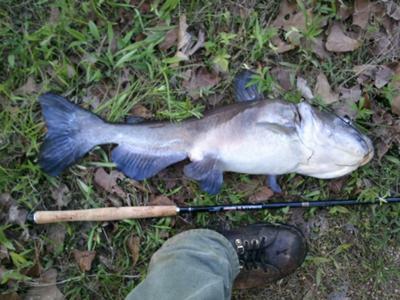 ), which was a 24" blue catfish. I didn't weigh it as I released it but the State of Missouri's length-weight chart pegs this one at a little over five pounds.....not bad at all for my second tenkara outing! Also keep in mind that this was a farm pond and not a flowing river. I do have several years' experience of chasing king and coho salmon down riverbanks in Alaska but a 5-lb catfish on a tenkara rod is probably not going to happen under those circumstances. Not selling myself short, just keeping it real. For the nonbelievers (and I can't really blame you) a picture is worth far more than this review. Thanks for the review. That is an amazing catch, and just adds more evidence that the longer tenkara rods can hold a big fish and still protect a light tippet.